Written by the iconic 19th-century individualist anarchist Benjamin Ricketson Tucker (1854–1939). Perhaps no figure was an influential as Tucker in defining the vigorous 19th-century individualist anarchist movement. Although Tucker was a prolific writer, almost the entire body of his writing appeared as articles in his periodical Liberty (1881–1908); which he published and edited for 27 years. Liberty is widely considered to be the finest individualist-anarchist periodical ever issued in the English language. Although some of his essays and articles were subsequently issued as pamphlets, the key sources of his writings remain Liberty and Instead of a Book – a wide-ranging selection of his own articles, which Tucker selected personally. First published in 1893, the selections constitute a lively and readable guide to the theory of individualist anarchism from civil liberties to economic rights, from a devastating critique of state socialism to a description of how anarchism would provide a defense system. 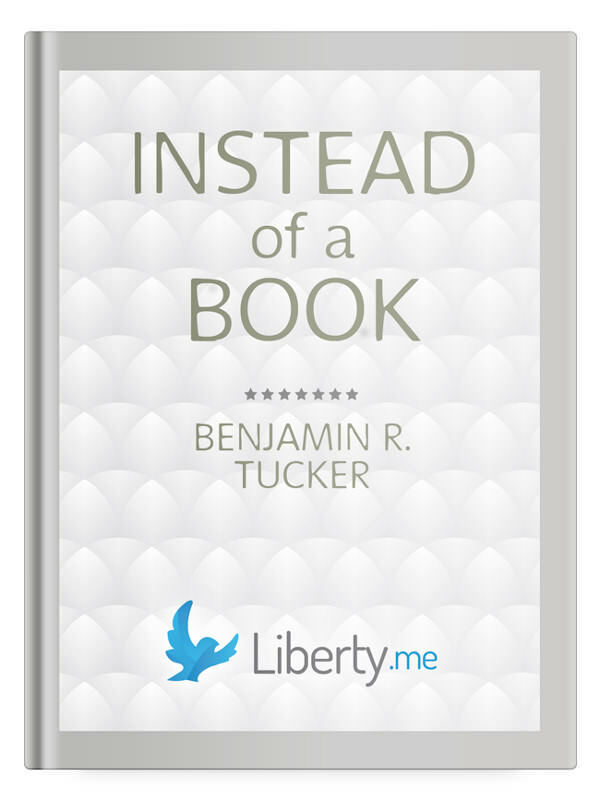 Instead of a Book offer an invaluable window into the personality of Tucker, the energetic 19th century libertarian movement and early individualist anarchism in America. On the first page of the first issue of Liberty, Tucker wrote, “Liberty, Equality, Fraternity, these three; but the greatest of these is Liberty. Formerly the price of Liberty was eternal vigilance, but now it can be had for fifty cents a year.” Much the same may be said of Instead of a Book. For a modest price, it is possible to access one of the most remarkable minds of the libertarian movement. A modern essay by Tucker scholar Wendy McElroy introduces Instead of a Book and comprehensively sketches the framework of Liberty and its publisher, providing invaluable context for both. The e-book presentation has been proofed and spell checked. The original wording or spelling has been maintained even when the usage seems antiquated and, so, to the modern eye may appear to be ‘in error’. This is done in order to maintain the flavor of the era and the delightful flare with which Tucker wrote.